This article provides detailed guidance to some of the business benefits of donating to charity, with a particular focus on tax breaks, recruitment and retention and customer/client engagement. Charities are always on the look out for funding and support from the community and very often local businesses and their owners are extremely generous. As well as supporting a good cause, for businesses, donating to charity can have an added benefit: it can create internal opportunities and increase the business’ engagement with customers/clients. The primary purpose of this article is to provide guidance for business owners who are thinking of making a gift to charity. Please read on for more information on these potential business benefits. The secondary purpose of this article is to provide guidance for charities looking to raise awareness of the business benefits of charitable giving in their local area. After a tough 2015, where the sector made the headlines for all of the wrong reasons, public trust in charities is at its lowest level since 2007; making this an important reminder for businesses. If this is a useful topic for you and your charity then you may also wish to use and distribute our charitable giving A4 flyer. 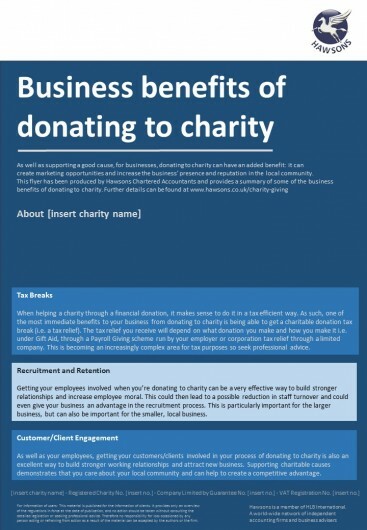 This flyer summarises the key business benefits or donating to charity and is an excellent free resource for you to leave on your reception or to hand out in your local area. Please contact Paul Wormald at [email protected] to request the flyer. Over the last few years we have seen an upward trend in the number of businesses from around the world that are embracing social causes as a way of benefiting both the charities that they support and themselves. This next section will summarise the key business benefits of donating to charity. When helping a charity through a financial donation, it makes sense to do it in a tax efficient way. As such, one of the most immediate and tangible benefits to your business from donating to charity is being able to get a charitable donation tax break (i.e. a tax relief). The tax relief you receive will depend on what donation you make and how you make it. The most popular of these is Gift Aid. If you pay tax, Gift Aid is a scheme by which you can give a sum of money to charity and the charity can normally reclaim basic rate tax on your gift from HMRC. That increases the value of the gift you make to the charity. So, for example, if you give £100 using Gift Aid that gift is worth £125 to the charity. You can find more information on these types of donations here. There are also some important points to be aware of following the recent changes to dividends which could see, following the introduction of new rules for dividends starting in April 2016, some charity donors hit by a tax increase. There has been a great deal of focus on the changes to the way dividend income is now taxed, but little coverage of the potential consequences to the charitable sector for certain Gift Aid donations made by individuals. In summary, it is possible that some current donors who have completed Gift Aid declarations for charities on the basis that they are taxpayers will find that these declarations are no longer eligible for Gift Aid. When companies make gifts of money to charities they are also able to gain tax relief. This charitable giving tax relief, however, works slightly differently than that for individuals, sole traders and partnerships and will see the company pay less corporation tax. Any benefit that you’re given in return must be below a certain value (see table below). You can find more information about whether your financial donation will qualify for tax relief here. Beyond a financial gift, other donations that are generally eligible for tax relief include the sponsorship of a charity or a charitable event and donations of equipment or services. There are different ways to claim tax relief depending on the type of donation you make and how you make it, but this is becoming an increasingly complex area for tax purposes. We recommend that you speak to an adviser about the possible tax implications of donating to charity. Getting your employees involved when you’re donating to charity can be a very effective way to build stronger working relationships and increase employee moral. Many of your employees may want to volunteer or raise money for charity but do not find time in their busy lives to do it – this could provide them with an opportunity to do so. In turn, this could then lead to a possible reduction in staff turnover and could even give your business an advantage in the recruitment process. This business benefit is particularly important in sectors where there is a high percentage of staff turnover (e..g retail and hospitality) and in sectors where there is only a ‘small pool’ of skilled and qualified workers (e.g. care and manufacturing). A number of recent studies have found that employees prefer working for businesses that provide volunteering opportunities and/or are active in supporting the local community. As well as your employees, getting your customers/clients involved in your process of donating to charity is also an excellent way to build stronger working relationships and also attract new business. Supporting charitable causes demonstrates that you care about your local community and can help to create a commercial competitive advantage. A report in 2013 by Forresters (a survey of 1,100 people from the UK) found that 82% of consumers, when faced with a choice between two companies that offered products and services for the same price, said that their decision would be affected by whether a company engaged with charities and the wider local community. If this is a useful topic for you and your charity then you may also wish to use and distribute our charitable giving A4 flyer. 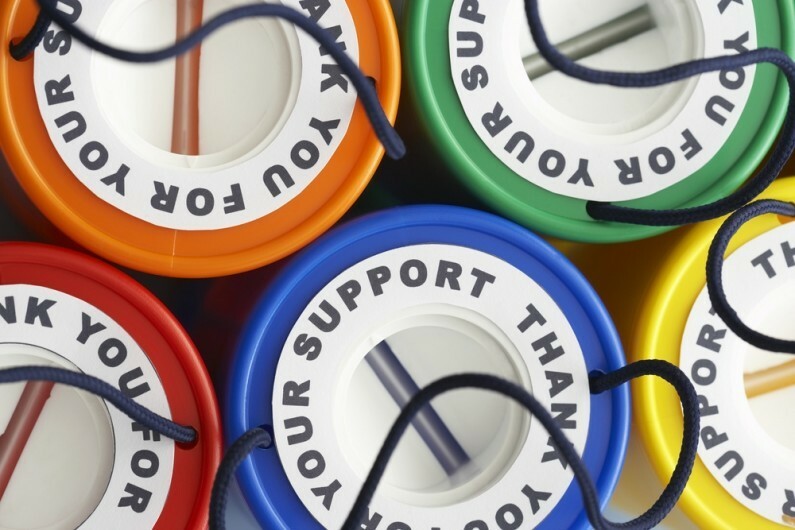 Speak to an adviser about the possible tax implications of donating to charity. As we have mentioned above, charitable giving is becoming an increasingly complex area for tax purpose and we strongly recommend that you seek professional advice before taking any action. This is an area we have a great deal of experience in and would be happy to help.